I was in the Asian market today picking up fresh sprouts for a batch of pad Thai I plan to make for supper tonight, and another customer in the store asked the clerk if anyone in the market had a recipe for lo mein. When no one in the market could give her an idea of how to go about it, I offered to help her out. 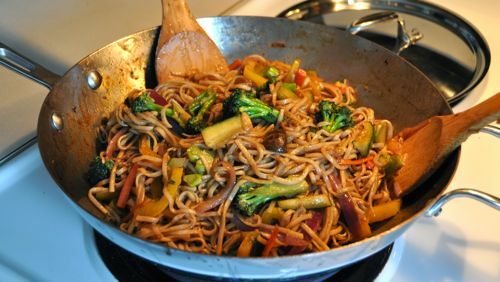 Not my favorite dish, although I do love a good plate of vegetarian lo Mein, here is a simple recipe for the noodle dish for beginners. There are certainly other, more complex recipes, and had I time (today is “Free Rita’s Day” here in Lancaster), I’d produce a recipe with much more complex flavor, but most neighborhood restaurants don’t go for complex, they go for fast and tasty. Here is one I got from a neighborhood restaurant in Alexandria, VA, when I lived in the Rosemont neighborhood. If you don’t know Rosemont, you haven’t lived. This is a wonderful, simple dish made with vegetables. It can be augmented with chicken, Chinese roast pork, shrimp, or tofu, and will taste even better. In a medium bowl, soak the Shitake mushrooms in 1/4 cup cold water for 30 minutes, or until softened. Drain and squeeze dry, reserving soaking liquid. Cut off and discard stems and thinly slice the caps. Wash the cabbage leaves in several changes of cold water and allow to thoroughly drain in a colander until dry to touch. Trim 1/4 inch from the stem end of the cabbage leaves and discard. Stack 2 to 3 cabbage leaves at a time and crosswise into 1/4-inch-wide shreds. In a 4-quart saucepan, bring about 2 quarts of water to a boil over high heat. Add noodles , return to a rolling boil, and boil 2 to 3 minutes. Rinse under cold water and drain the noodles thoroughly. Transfer to a medium bowl, add sesame oil and 1 tablespoon soy sauce, and mix well. Set aside. Heat a 14-inch flat-bottomed wok or 12-inch flat skillet over high heat until hot but not smoking. Add 1 tablespoon peanut oil and ginger, and stir-fry 20 seconds. Add the onions, celery, carrots, scallions, and mushrooms, and stir-fry 1 minute, or until vegetables are just limp. Transfer vegetables to a plate. Add 1/4 cup water and broccoli; cover and steam 3 minutes, then drain and place on the plate with the other vegetables. Add the remaining 2 tablespoons vegetable oil and cabbage, and stir-fry 1 minute, or until cabbage begins to wilt. And the cooked carrot mixture, noodles, and reserved mushroom soaking liquid, and stir-fry 2 to 3 minutes, or until noodles are heated through. Swirl in the remaining 1 tablespoon soy sauce and oyster sauce and toss to combine. Serve immediately. * Note: If you choose to add protein ingredients such as chicken, shrimp, tofu, or pork, stir-fry them until just barely done after stir-frying the vegetables but before the cabbage. Set aside on a warm plate. Then resume the recipe with with the cabbage and continue until hot and well mixed. 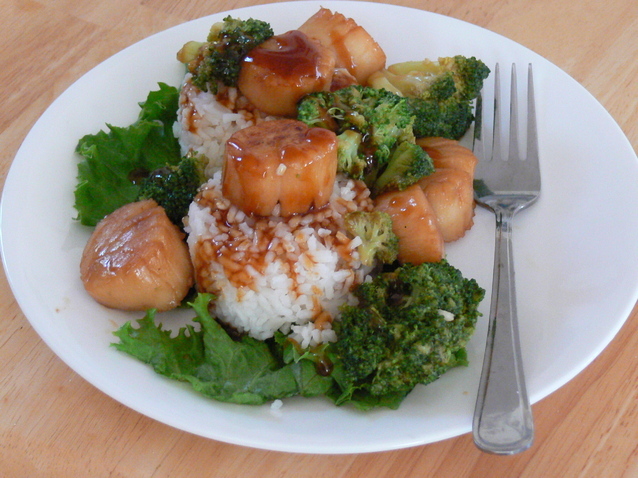 If you add protein ingredients, double the oyster sauce and increase the soy sauce by 1 tablespoon.